Tektronix today released new firmware for the 5 Series and 6 Series MSO mixed signal oscilloscopes that unlocks a new analysis tool called Spectrum View. A free upgrade, Spectrum View allows you to perform mixed domain analysis on the big, high-resolution displays of the 5 and 6 Series MSOs. This mixed domain capability can be added to any 5 or 6 Series MSO just by installing the firmware, and all new instruments will feature this functionality out of the box. A new firmware upgrade for the 5 and 6 Series MSO enables simultaneous analog and spectrum views with independent controls in each domain. 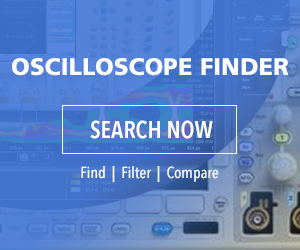 Until now, the Tektronix MDO4000C mixed domain oscilloscope has been the only oscilloscope to offer synchronized time and frequency domain analysis with independent control over waveform and spectrum views. It accomplishes this by incorporating a full spectrum analyzer with its own dedicated input channel. To address the need for RF analysis in its higher performance 5 and 6 Series MSO mixed signal oscilloscopes, Tektronix is taking a new approach that does not require a separate input channel while still offering similar capabilities. This latest firmware enables patented technology already built into the scopes. Hardware in the instrument enables you to simultaneously look at the analog waveform view and spectral views with independent controls in each domain. A view of analog waveforms, frequency spectra and digital waveforms. Independent controls let you adjust the spectrum with familiar center-frequency, span, and RBW controls, without affecting the time scale in the waveform view. The opposite is also true – changes to the horizontal scale do not impact the spectrum. Independent controls make it easy to correlate frequency domain activity with other time domain phenomena. Independent controls let you adjust spectrum with familiar controls. Both the 5 and 6 Series MSOs have FlexChannel inputs. Each of the inputs may be used as a single analog channel or eight digital channels. With the Spectrum View, any analog signal may be viewed as a time domain waveform, a frequency domain spectrum, or both at the same time. Digital channels are enabled by simply attaching a TLP058 logic probe to any input. This means any input can be used to look at analog waveforms, frequency spectra, or digital waveforms. Flex Channel controls means any input can be used to look at analog waveforms, frequency spectra, or digital waveforms. You can also perform mixed domain analysis on more than one channel. With Spectrum View you can also perform mixed domain analysis on more than one channel at the same time.